-Emilia Emberheart is a 6ft tall 22 years old and is a proud mother who adores her daughter more than anything. She is a natural born fire (bender) user. she emits flames from her body or any part of her body. She is very overprotective when it comes to her daughter but is fine if Bunny is watching her. she hates one thing above all else, and that is being called a "Widow." -Rue Emberheart is a 3'1" 4 year old who is a very good, clever, and quiet little girl. she has the Ditto ability. not the morphing kind but the ability to copy other's abilities. Rue likes to explore new places and make friends with knew people. When she explores she usually makes sure she has the OK from her Mom, but if she is extremely curious about something she will leave without a trace. 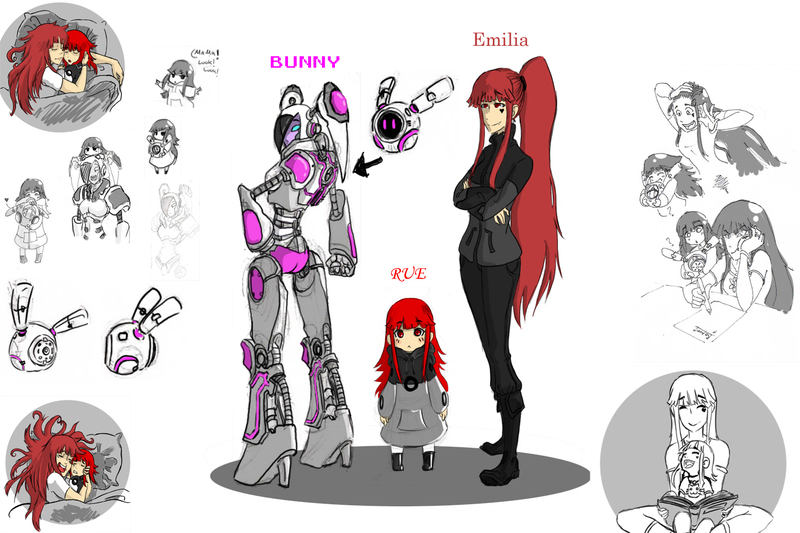 -BUNNY is an AI placed in a small spherical bot. the large android that stands on the left is like a battle armor/casual wear for BUNNY. She is inserted in the backpack like contraption. The sphere is a diameter of 8 inches and her armor is 5'10". . typically like any and many androids, she is strong has hidden weapons and is quick, but if anything she lacks in intelligence...she is giddy and always positive and is curious about the world she operates in. she enjoys being carried around by Rue and for some reason does not like Emilia. Her armor has a setting where she can appear completely human so that she doesn't stand out in public areas.